“the BBC’s reputation for impartiality” – LOL. Surely you are taking the Michael. Let’s not forget, by the way, that the Times has published full-on antisemitic cartoons, and also antisemitic lies in 48-point Times New Roman on its front page. It would be helpful in refuting this claim if The Jewish Chronicle didn’t have the same headline as Mr Bowen, on its own article. Earlier today it was main headline on the front page. Precisely. 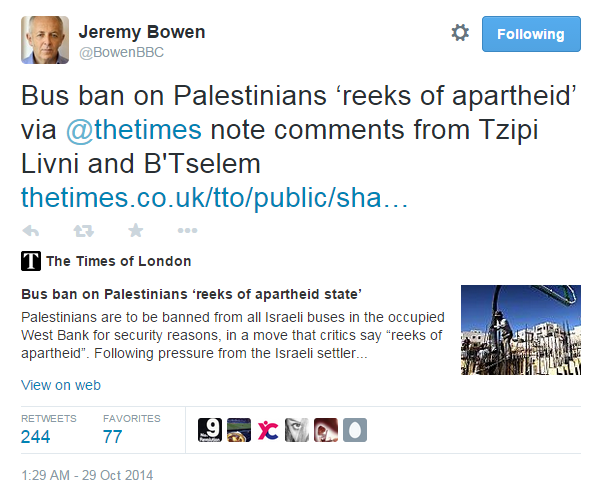 And it is Tsipi Livni’s comment, reported there, which Bowen is correctly quoting, and correctly attributing. Bowen is a pathetic twisted and bitter old tax payer funded antisemite. No british jew should pay the license fee.